Smiley360 is an online community of influential consumers who try products, content and other experiences for free and share their opinions with others. As a member, you will receive offers from the biggest brands and share your experience with that brand, as well as with friends, family, coworkers, neighbors and other consumers like you. How long before I get a Mission to try something new? That depends. It could be today. It could be two months from now. Qualify for Missions by completing surveys, keeping your profile up-to-date and participating in community activities like discussions. Look out for invitations in your email inbox and on your dashboard! What do I do when I receive something new to try? When you're on a Mission, share your thoughts, opinions and experiences about what you received. Always be honest, informative, detailed, helpful and authentic when writing reviews and sharing content. By using the Smiley360 Sharing Tools, you can let your friends and followers know about your experience, and earn points and badges for participating. 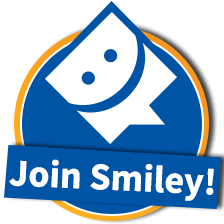 You earn points for every activity you take on Smiley360: filling out your profile, sharing on Missions, taking surveys. Points are not redeemable for anything, but when you earn points, you're showing us that you have what it takes to be a Smiley member—meaning more offers will come your way.